Friday started exactly how Thursday ended; waiting for my flight to depart at LAX (Los Angeles International Airport). They started boarding passengers at 12:05 am, and we took off at 12:49. The flight arrived in Minneapolis just before 6:00 am, and I had just 40 minutes before I was on a plane to Milwaukee. I took the Super Saver shuttle back to the remote lot, and drove back to Fort for some rest. I did a bunch of unpacking and repacking for the weekend, and I wound up with only two hours of sleep. I got up at 1:45 pm to write the post for Thursday, and then left for Milwaukee at 4:20. I had listed my ticket on Twitter as available for Friday’s game (for a $25 Be The Match donation), and a friend from elementary school (Jason) said he’d be up for the game. 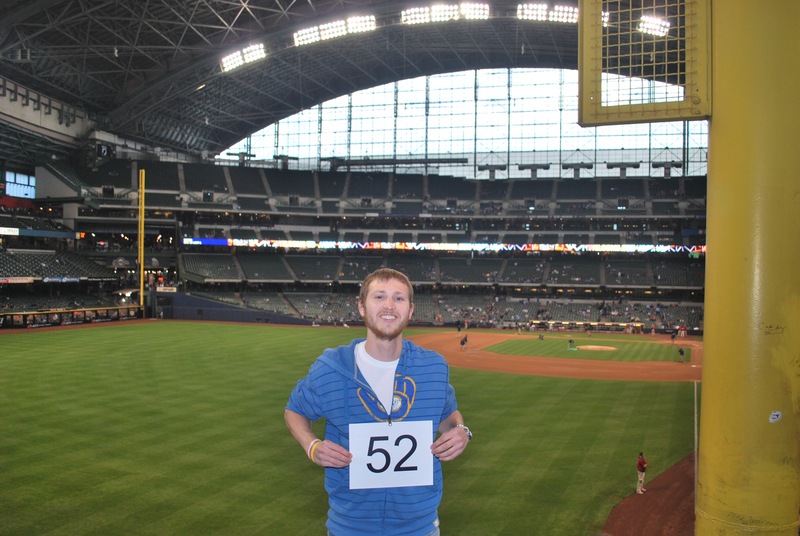 We met in Johnson Creek, and got to Miller Park just before 5:45. I spent 20 minutes or so in the parking lot, informing tailgaters of what I was doing and handing out cards. It’s nice when people have heard about what I’m doing, but it’s also cool when they haven’t, which makes me feel better about going (car) door-to-door. Of the 25 or so people that I talked to yesterday, I don’t think any of them had heard about it. A few sounded genuinely interested, and amazed at my fanaticism. I met Jason inside at 6:15 and we waited for batting practice to end before getting game number 52 taken. I made sure to include the foul pole in this one, so you can see that I’m not getting the picture taken from the same spot every time. As always, I walked around the press box behind home plate (in the concourse), to see the Ice Man before heading to my seat. 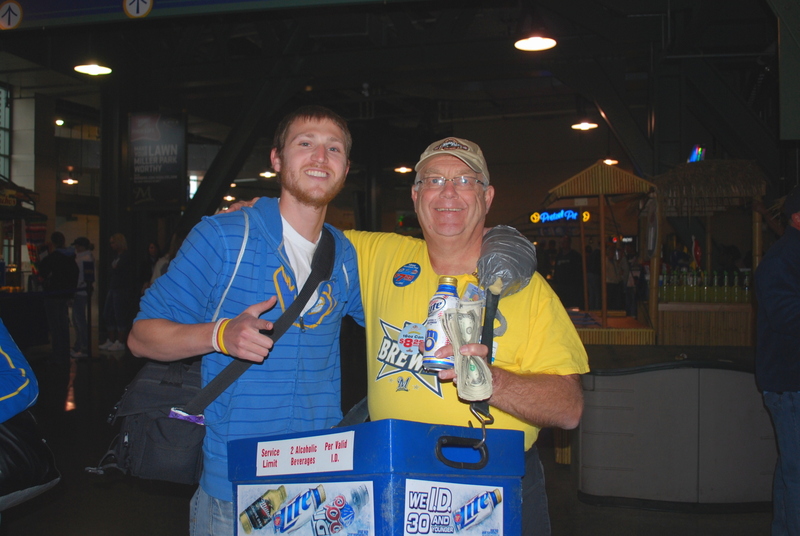 I figured it was time to get a picture with the best beer vendor in Miller Park. We exchanged “YOHHHHHHHs!! !”, “OOOOOOs!”, and “AHHHHHHs!” and then I asked him for a picture. Afterwards he yelled “BEN’S BACK FROM LA!! !” He’s a great guy, and is usually roaming between sections 201 and 215 (along the first base side in the loge level). Stop by and say hi if you’re in Miller Park, even if you’re not buying a beer, he’s as friendly as they come. We then walked down the stairs leading to section 216, to say hi to Bill (the friendliest usher in Miller Park), and he shook my hand and said “nice article”. I had kind of forgotten about the Game Day interview I had done with Jim Cryns a few weeks ago, and apparently it was in this home stand’s Game Day magazine. 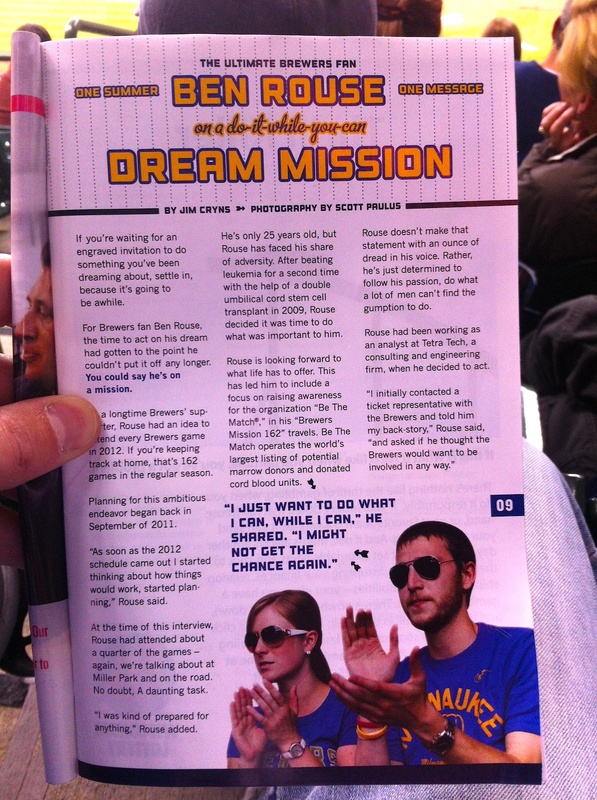 The Game Day magazine is a small (playbill-sized) magazine that they hand out for free at Miller Park. There’s mention of me on the cover of the current edition, and then the article starting on page nine. I was a little disappointed with the picture that they chose to accompany the article. Victoria is even more disappointed. We both look like we’re upset, or annoyed, or… something, but not happy. The photographer had told us to just act normal when he was there, and I think we were just clapping about something simple, like a groundout by the opposing team. I think it kind of looks like I’m whistling, which I don’t really do at games, but Victoria just looks unhappy to be there, which wasn’t the case. If this was the best picture he got, then I’m afraid to see the other ones. Notice the slightly curled middle and index fingers on my right hand? That provides the perfect curvature of the hand, and maximizes the audible volume of the clap. Trust me, it’s science. The game got underway and the Crew jumped out to an early lead on Nyjer Morgan’s solo home run in the bottom of the first. This was news for multiple reasons, it was his first home run of the year (which isn’t too noteworthy since he doesn’t hit many dingers), but mainly because it was his first RBI of the season. He set an MLB record in plate appearances to start a season without an RBI (138). So in the 130 plus years of Major League Baseball, no one has opened a season on a longer RBI drought. Impressive and unimpressive at the same time. He had 28 hits coming into the game, so it’s likely that there was rarely, if ever, a runner at second base for any of those hits. Needless to say some bad luck was also involved in the forgettable streak. The Pirates took a lead that they wouldn’t relinquish, however, when they posted six runs on six “hits”. I put the hits in parenthesis because one of them should’ve been an error, but since the outfielder didn’t touch it, it’s ruled a hit. With two outs and the bases loaded Jose Tabata lined one to Nyjer Morgan in center. He came in on the ball at first, realized it was going to go over his head, stopped, and jumped for it. It just narrowly missed the tip of his glove, and went all the way to the centerfield wall. In the box score it looks like a clean bases clearing two-bagger, but it was a misjudged liner, and Wolf takes the ERA hit. Corey Hart hit a solo homer in the sixth, and the Pirates added two in the eighth. Final Score: Pirates 8 – Brewers 2. Without the mishap in center it would have only been a 3-1 game after the third inning, so who knows if the five run deficit played a role in the mindset of the Brewers batters. It’s only the fifth win for the Pirates at Miller Park in their last 43 appearances. You read that correctly, the Brewers were 38 – 4 in their previous 42 home games vs. the Pirates dating back to 2007. I did miss one pitch during Friday’s game, and it came with only three outs remaining in the game. I was putting my glove in my bag and making sure I had everything packed up, and I looked up to see a 1-0 count on Carlos Gomez. A new consecutive pitch streak was set though, eclipsing the old mark by over 100 pitches. I’ve also added a new stat in the season stats: distance traveled as a percentage of the Earth’s circumference. By the end of the year I should have traveled roughly 1.6 times around the Earth (in theory). I’m going to today’s (Saturday) game with Victoria, my sister Becca, and her fiancé Lee. Lee was born and raised in Wisconsin and yet is a Pirates fan. It should be a grand ol’ time. Hopefully the Crew can turn it around and get back to their winning ways versus the Buccos.